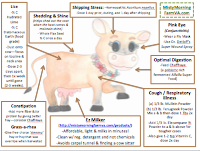 Grab your free gift below, and learn some of our easy, ready-to-go tips about natural cow care! In today’s world our relationship with food is becoming more & more muddled. You find milk & other dairy products behind shiny glass doors in a refrigerated case. And the only indication of their origin is a cheerful illustration of a cow in a pasture & a little paragraph on the carton. It’s a way to get back to eating real dairy foods from a source you can trust. Not from a glass refrigerated case, but straight from the udders in your own backyard. Maybe you already have some chickens or a garden. Your on the right track, and now your ready for your cow. A cow is a valuable investment. A perennial that continues giving year after year. 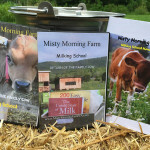 She’ll help teach your children responsibility, nourish your family, and provide you with a steady source of whole sustainable and truly local food. The cow lifestyle is wonderful, and we want to help you experience it too. We are here to tell you YOU CAN DO IT!